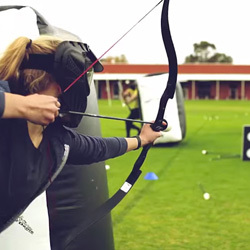 Archery Tag is played similar to dodgeball with our bows and patented foam-tipped arrows. This exciting, action-packed game offers the ultimate family-friendly experience that engages everyone. Two teams, consisting of 5 to 10 players each playing opposite one another, are separated by a “safe zone." Each team also has what we call a “5-Spot Knockout Target.” There are two objectives: 1) to hit the opponents, and 2) to knock out the five discs of the opposing team’s target. You eliminate a player by hitting him or her with an arrow, or by catching his or her arrow. The 5-Spot Targets work to save a “life” of one of the players. A “hit” player can be called back into the game when a target spot is knocked out or when a teammate catches an arrow. 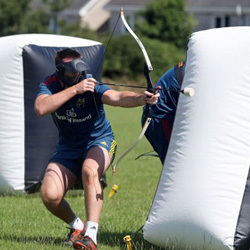 Unlike some other sports, the only safety equipment required to play Archery Tag is a facemask. 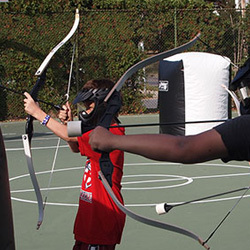 Players experience virtually no pain when "hit" with our Archery Tag arrows. 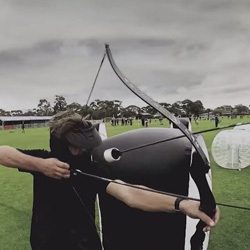 Arrows should be used only with Archery Tag Bows, and will in no way be used in any other type of bow. Failure to adhere to this rule can result in equipment damage, personal injury..
Games work on a team of 5 so if 20 players play we make 4 teams which compete against each other. 60 min play time up to 20 players. 90 min play time up to 30 players. 120 min play time up to 40 players.